Japanese quails (Coturnix japonica) are migratory birds that are called by a handful of different monikers, which include pharaoh quail, coturnix quail and eastern common quail. Pharaoh quails and coturnix quails refer to the same bird -- Japanese quails. The species first underwent domestication in 11th-century Japan. Japanese quails originated in Asia in countries such as Japan, Korea, Mongolia, China, Vietnam, Thailand, Russia, India and Bhutan. Reproductive activities for these birds occur in the northern portion of their geographic scope, and they spend the winter months in warmer, southerly locales. In Japan, some Japanese quails remain in one place all year long. Numbers for Japanese quails are getting lower and lower out in nature, and because of that they were placed into the "near threatened" category by the IUCN Red List of Threatened Species in 2012. Risks for the species are both hunting and farming activities. Japanese quails tend to occupy several types of environments, which include the edges of rivers, grasslands, steppes, meadows and rice paddy fields. They tend to gravitate toward airy and open habitats. Although the population of Japanese quails in these settings is getting smaller, their domesticated populations are still going strong. They are frequently used as food sources for people -- both for their flesh and their eggs. The plumage of Japanese quails is, for the most part, a deep brown color. However, it also possesses light yellowish-brown elements. Their beaks and limbs are either grayish-pink or grayish-orange. Japanese quails attain reproductive capabilities once they're 6 weeks of age. These swift-growing and robust birds' tiny eggs take roughly 17 days to hatch, and mothers manage incubation all by themselves. The size ranges for their clutches differ slightly depending on exact geographic location. In Russia, they're made up of between five and nine individual eggs, while in Japan, they're made up instead of between five and eight eggs. The menu for these quails consists of a lot of plants, although they readily consume invertebrates such as bugs and worms, particularly during the summer months. They also often feed on bug larvae. 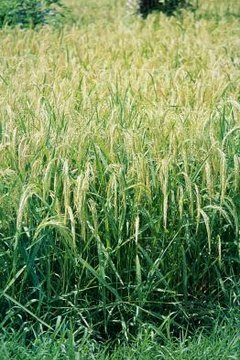 Grass seeds are a strong dining preference for Japanese quails -- think white millet and pannicum, for a couple of examples. What Are the Predators of the Blue & Gold Macaw? What Is the Hooded Oriole's Migration? How Long Does It Take for Mallards to Mature?